A 16.5% pelleted complete feed to be fed to all classes of goats. Feed at a rate of 3-4% of body weight for added bloom and accelerated growth. Can also be fed to mature goats at a rate of 1-2% of body weight to maintain bloom and freshness of muscle expression. A 15.5% pelleted creep feed and starter for goats up to 6 months of age and to developing bucks and show does that require a little extra bloom. A 16% complete textured feed formulated to be fed to all age classes of goats and sheep. Supplemented with Ammonium Chloride for the prevention of Urinary Calculi. 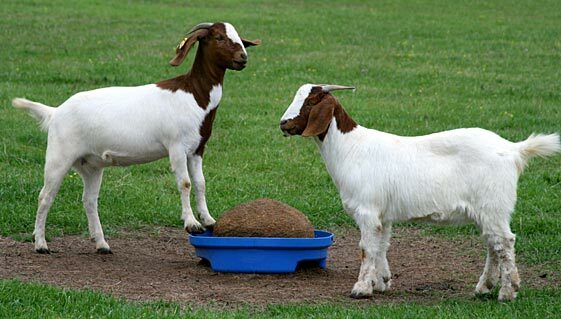 A 14% protein complete textured feed designed for goats of all ages and for goats on pasture. Contains Ammonium Chloride to help reduce the risk of Urinary Calculi. Also contains copper therefore should not be fed to sheep. A 15% pelleted feed designed to add flesh and bloom to soften the overall appearance while maintaining muscle expression. Feed at a rate of 1.5-3% of body weight per day. A 16% well balanced textured feed formulated to promote maximum muscle growth and skeletal development. Rumensin serves as the medication while an added probiotic helps to improve and stimulate the immune system and improve ruminal health. Also formulated with Bluelite Technology containing Betaine to prevent heat stress by regulating body temperature and added electrolytes to stimulate water intake. Feed at a rate of 2% of bodyweight per head per day with a small amount of a good quality hay. A highly palatable creep ration designed to maximize early muscle shape and expression. Mini-pellet form to encourage early consumption. A complete feed designed to maximize muscle development and provide an ideal handle, while maintaining enough fat cover for the extra smooth finish. An 18% highly fortified pelleted feed designed for optimal muscle growth and skeletal development. Medicated with Deccox and contains a probiotic for rumen health and to improve the immune system. Formulated with a zinc source for hoof health and Bluelite Technology to prevent heat stress by regulating body temperature and added electrolytes to stimulate water intake. Feed at a rate of 2% of bodyweight per head per day with a small amount of a good quality hay. A well-balanced blend of grains make up this 18% textured feed that was designed to advance muscle growth and skeletal soundness. Medicated with Deccox and contains a probiotic for rumen health and to improve the immune system. Formulated with a zinc source for hoof health and Bluelite Technology to prevent heat stress by regulating body temperature and added electrolytes to stimulate water intake. Feed at a rate of 2% of bodyweight per head per day with a small amount of a good quality hay. Premium Sheep and Goat Tub is a concentrated protein supplement for all classes of goats and sheep. The increased protein levels can dramatically improve forage digestion and intake with added Vitamin E to help meet animal requirements. Sheep-lyx™ Tub is a 16% protein, nutrient-dense supplement designed for all classes of sheep consuming forage-based diets. Sheep-lyx contains no added copper. Goat-lyx™ Tub is an 18% all-natural protein supplement that is specifically fortified for goats. It is formulated to provide the added nutrition for enhancing forage utilization and production measures for growth, lactation, reproduction and health. Grain products, plant protein products, processed grain by-products, calcium carbonate, molasses products, blended poultry and vegetable fat preserved with BHA, sodium bentonite, monocalcium phosphate, dicalcium phosphate, salt, calcium sulfate, magnesium sulfate, potassium sulfate, manganous oxide, zinc oxide, ferrous sulfate, cobalt carbonate, sodium molybdate, ethylenediamine dihydriodide, vegetable oil, vitamin A acetate, vitamin D3 supplement, zinc methionine, vitamin E supplement, sodium selenite, artifical flavor, ammonium chloride, vitamin A supplement, propionic acid, acetic acid, ammonium hydroxide, vermiculite, calcium bentonite. Feed as a sole ration. Always provide hay and /or pasture along with feed. Provide clean, fresh water at all times. Grain products, plant protein products, dicalcium phosphate, salt, calcium carbonate, dl-methionine, vitamin A supplement, vitamin D supplement, vitamin E supplement, vitamin B supplement, menadione sodium bisulfite, riboflavin, d-calcium pantothenate, niacin supplement, folic acid, choline chloride, zinc oxide, ferrous sulfate, manganous oxide, copper sulfate, ethylenediamine dihydroiodide, sodium selenite, tallow. Feed continuously as the sole ration. Provide clean, fresh water at all times. * This includes not more than 1.6 % equivalent protein from non- protein nitrogen. Grain products, plant protein products, processed grain by-products, calcium carbonate, molasses products, monocalcium phosphate, potassium chloride, magnesium sulfate, vitamin E supplement, d-biotin, montmorillonite clay, diatomaceous earth, dextrose, sucrose, calcium silicate, propylene glycol, ferrous sulfate, sodium chloride, manganese chloride, zinc chloride, copper chloride, vitamin A supplement, animal fat, selenium, ethylenediamine dihydriodide, cobalt carbonate, wheat middlings, cereal food fines, salt, lactose, dehydrated alfalfa meal, potassium carbonate, citric acid, vegetable oil, calcium salts of long chain fatty acids, tricalcum phosphate, sodium bisulfate, cane molasses, sodium silico aluminate, sodium bicarbonate, betaine hydrochloride, active dried yeast, urea formaldehyde condensation polymer, dl-Alpha tocopheryl acetate (source of vitamin E activity), artificial flavors, biotin, zinc proteinate, fructose, glycine, thiamine mononitrate, dried aspergillus oryzae fermentation extract, wheat bran, calcium lactate, dl-methionine, L-lysine monohydrochloride, vitamin A acetate, saccharin sodium, monosodium phosphate, vitamin D3 supplement, chloine chloride, dried bacillus subtilis fermentation product, dried bacillus licheniformis fermentation product chloine bitartrate, niacinamide, ascorbic acid, calcium pantothenate, riboflavin, vitamin B12 supplement, pyridoxine hydrochloride, folic acid, ammonium chloride, soybean oil, urea, kaolin, saccharomyces cerevisiae yeast culture, dried enterococcus faecium fermentation product, dried lactobacillus acidophilus fermentation product, dried aspergillus niger fermentation extract, dried trichoderma longibrachiatum fermentation extract, dried bacillus subtilis fermentation extract, artificial flavor ingredients, propylene glycol, copper sulfate. Feed continuously as sole ration a feed containing 20 g/ton of Monensin. Always provide clean fresh water at all times. Do not allow horses or other equines access to feeds containing Monensin. Monensin medicated goat and cattle feeds are safe for use in goats and cattle only. Consumption by unapproved species may result in toxic reactions. Feed continuously. Do not feed to lactating goats. For the prevention of coccidiosis in young sheep caused by Eimeria ovinoidalis, E. crandallis, E. parva and E. bakuensis. * This includes not more than 0.9 % equivalent protein from non-protein nitrogen. Processed grain by-products, grain products, plant protein products, roughage products, calcium carbonate, wheat middlings, cereal food fines, dextrose, potassium chloride, salt, lactose, dehydrated alfalfa meal, sucrose, potassium carbonate, citric acid, vegetable oil, calcium salts of long chain fatty acids, tricalcum phosphate, sodium bisulfate, cane molasses, sodium silico aluminate, sodium bicarbonate, betaine hydrochloride, active dried yeast, urea formaldehyde condensation polymer, dl-Alpha tocopheryl acetate (source of vitamin E activity), artificial flavors, biotin, zinc proteinate, magnesium sulfate, fructose, glycine, thiamine mononitrate, dried aspergillus oryzae fermentation extract, wheat bran, calcium lactate, dl-methionine, L-lysine monohydrochloride, vitamin A acetate, saccharin sodium, monosodium phosphate, vitamin D3 supplement, chloine chloride, dried bacillus subtilis fermentation product, dried bacillus licheniformis fermentation product chloine bitartrate, niacinamide, ascorbic acid, calcium pantothenate, riboflavin, vitamin B12 supplement, pyridoxine hydrochloride, folic acid, molasses products, montmorillonite clay, diatomaceous earth, monocalcium phosphate, dicalcium phosphate, calcium sulfate, potassium sulfate, manganous oxide, zinc oxide, ferrous sulfate, cobalt carbonate, sodium molybdate, ethylenediamine dihydriodide, zinc methionine, vitamin E supplement, sodium selenite, artificial flavor, soybean oil, ammonium chloride, saccharomyces cerevisiae yeast culture, dried enterococcus faecium fermentation product, dried lactobacillus acidophilus fermentation product, dried aspergillus niger fermentation extract, dried trichoderma longibrachiatum fermentation extract, dried bacillus subtilis fermentation extract, manganous methionine, copper lysine, cobalt glucohephonate, calcium silicate, artificial flavor ingredients, propylene glycol. Feed 1.01 lbs per 100 lbs bodyweight to provide 22.7 mg per 100 pounds of bodyweight (0.5mg/kg) per day. Always provide hay and /or pasture along with feed. Provide clean, fresh water at all times. Feed at least 28 days during periods of exposure to coccidiosis or when experience indicates that it is likely to be a hazard. Feed Type C feed or milk replacer at a rate to provide 22.7 mg decoquinate per 100 lb (0.5 mg/kg) bodyweight. Type C feed may be prepared from dry or liquid type B feed. Grain products, plant protein products, processed grain by-products, calcium carbonate, molasses products, wheat middlings, cereal food fines, potassium chloride, salt, lactose, dehydrated alfalfa meal, potassium carbonate, montmorillonite clay, diatomaceous earth, dextrose, sucrose, calcium silicate, propylene glycol, citric acid, vegetable oil, calcium salts of long chain fatty acids, tricalcum phosphate, sodium bisulfate, cane molasses, sodium silico aluminate, sodium bicarbonate, betaine hydrochloride, active dried yeast, urea formaldehyde condensation polymer, dl-Alpha tocopheryl acetate (source of vitamin E activity), artificial flavors, biotin, zinc proteinate, magnesium sulfate, fructose, glycine, thiamine mononitrate, dried aspergillus oryzae fermentation extract, wheat bran, calcium lactate, dl-methionine, L-lysine monohydrochloride, vitamin A acetate, saccharin sodium, monosodium phosphate, vitamin D3 supplement, chloine chloride, dried bacillus subtilis fermentation product, dried bacillus licheniformis fermentation product chloine bitartrate, niacinamide, ascorbic acid, calcium pantothenate, riboflavin, vitamin B12 supplement, pyridoxine hydrochloride, folic acid, soybean oil, monocalcium phosphate, dicalcium phosphate, calcium sulfate, potassium sulfate, manganous oxide, zinc oxide, ferrous sulfate, cobalt carbonate, sodium molybdate, ethylenediamine dihydriodide, zinc methionine, vitamin E supplement, sodium selenite, artifical flavor, ammonium chloride, urea, kaolin, manganous methionine, copper lysine, cobalt glucohephonate, saccharomyces cerevisiae yeast culture, dried enterococcus faecium fermentation product, dried lactobacillus acidophilus fermentation product, dried aspergillus niger fermentation extract, dried trichoderma longibrachiatum fermentation extract, dried bacillus subtilis fermentation extract, roughage products, artificial flavor ingredients, propylene glycol. Do not feed to sheep producing milk for food. This feed contains non protein nitrogen.